There are so many planner options out there these days, guys! When I went to enter the world of paper planners, my head started spinning. And then, I purchased one, and there were so many new places to write things down, it just got overwhelming. I figured out how to use my planner to it’s fullest by reading blog posts and watching videos from other planners. I’ve only used the Inkwell Press Planner for a couple of months, but so far it is perfect for me. Dare I say, I may have found planner peace! It has been fantastic at helping me manage running a business alongside my parenting and volunteering duties. In fact, I think it’s a must-have if you’re working from home or volunteering. If you want some ideas on how to organize your life with a new planner, read on. I hope it helps. Update: I’ve now transitioned to the Inkwell Press A5 Classic Inserts and a Carpe Diem planner. If you’d like to see that full set up and how it helps me stay organized, you can see that here. So, that’s all the features of the Inkwell Press Planner that I love. To see how I use each section to it’s fullest to keep me organized with my business and volunteer schedule, keep reading! Every month, before I do anything else, I fill in my monthly mission board and create my projects and tasks list on the note page. This helps me stay on task weekly and gives me something to refer to as I fill in my weekly spread so that I can stay focused on my goals. 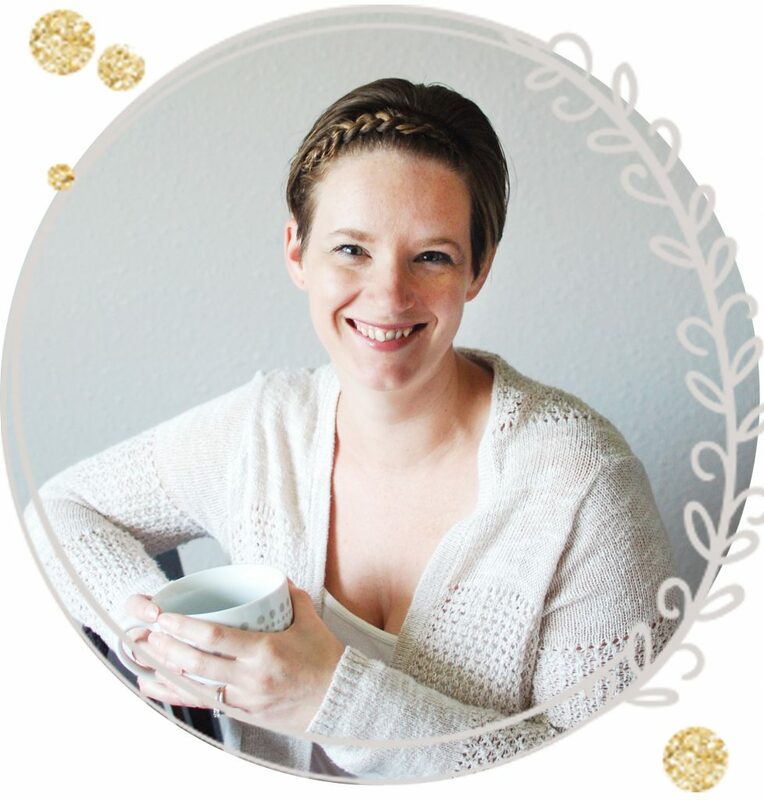 On the side column of this page, there is a cool goals section, which is a great place to re-iterate all of your to-do’s and goals that you added to your mission board. I also like to keep a small section of this to list the books that I’m reading, so I can keep track of my Pop-Sugar Reading Challenge results. As you can see from the photo, already in November I have a few school functions marked, my daughter’s birthday, and a strip of washi tape to mark Thanksgiving break. This will fill up as it gets closer to November. My weekly page is where I spend the majority of my time. I sit down every weekend at some point, and layout the upcoming week. I can spend as little as 5 minutes, or as much as 45 minutes on this task, depending on my mood. My weekly view pretty much contains my entire life. I have a lot to keep up with every week between my kids, businesses, volunteer schedule, and weekly errands. You can see from the way I’ve separated things in this spread, that I’ve got everything broken down into sections. This is the system that works for me, but of course, everyone is different. On the very top, under each date, I leave a space for important daily tasks. This is where I put the tasks that will require the most planning. This can include things like grocery shopping, PTO meetings, morning classes or play dates for my toddler, and more. Under that section, I’ve added a space to keep a daily checklist. This section usually contains things like my daily chores, errands, project deadlines, and reminders. Basically, anything that I can’t forget to do on any given day. Last, I put in all of our evening plans. This section of my planner is mostly dedicated to my oldest daughter and her extra-curricular activities. Her cheer practices, dance classes, extra homework assignments, and Girl Scout activities are all written down in this section. At the bottom of the weekly pages in the Inkwell Press, there are extra boxes. I’m still trying to figure out how I want to use all of this space, but so far, I use this to write down our weekly meal plan. I look at this daily so that I know if I have any extra prep to do, or if I need to thaw out meat earlier in the day. I’m also attempting to track the weather in one of the boxes, but it changes so frequently here, that I’m not sure I’ll keep that up for long. Yes. As you can see, my planner is very decorated. I know there are people that think it’s silly, or that it’s a waste of money, but we all have our own reasons for doing things the way we do. I’ll admit that when I was first introduced to the idea of decorated planning, I laughed a little. Then, I realized how much it could help me stay on task. I’m a very visual person, and not only am I more likely to look at my planner daily if it’s pretty, but these stickers help me mentally separate tasks, as they all have their own box. It’s like a highlighter for important tasks, but more fun. Think about it. Aren’t you more likely to keep up with a habit if it’s something you enjoy? Sitting down each weekend and putting together a new week of plans helps me relax and gives me something amidst all of my daily chaos that is just for me. As a small handmade business owner, I obviously love to support small businesses. I buy almost all of my stickers from Etsy shops and small online businesses. If you’d like to check out some of my favorites see them below! Krissyanne Designs for pretty much everything! I buy her weekly kits, functional stickers, event stickers, and even Maybooks! Her customer service is great, and her product range is huge. Libbie & Co who I also shop with for all sorts of items. My favorite new item in her shop is the monthly kits. They’re functional and decorative at the same time, and I can use as much or as little as I want. Small Town Grace is a new favorite of mine. I’ve only shopped there a couple of times, but her stickers are so cute, and her kits are the exact right size for me. Tallulah Grace Crafts is one of the first shops I purchased from without a friend’s recommendation. I just couldn’t pass up her style! She also offers a really cool frequent buyer incentive. Paper planners have been a lifesaver for me. As I mentioned before, between my volunteer work, online businesses, kids, and husband, I have a lot to remember all the time! I’ve tried a few brands of paper planners, including the simple ones from Walmart, but really, the Inkwell Press is currently my favorite. 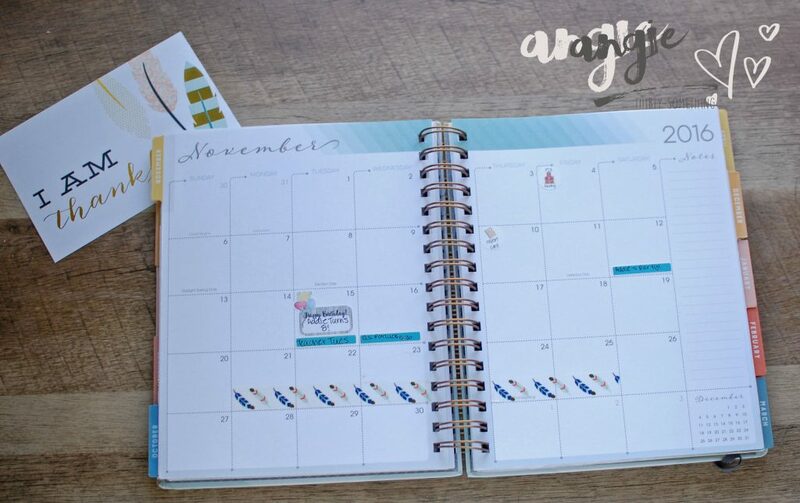 I love the features that are included with this planner, and I love the space it offers for keeping up with my daily tasks. If you’re new to the paper planning community and want to know more, feel free to leave me a comment below and I’ll do my best to answer! I’d also love to hear about your planner, if you’re an “addict” like me! 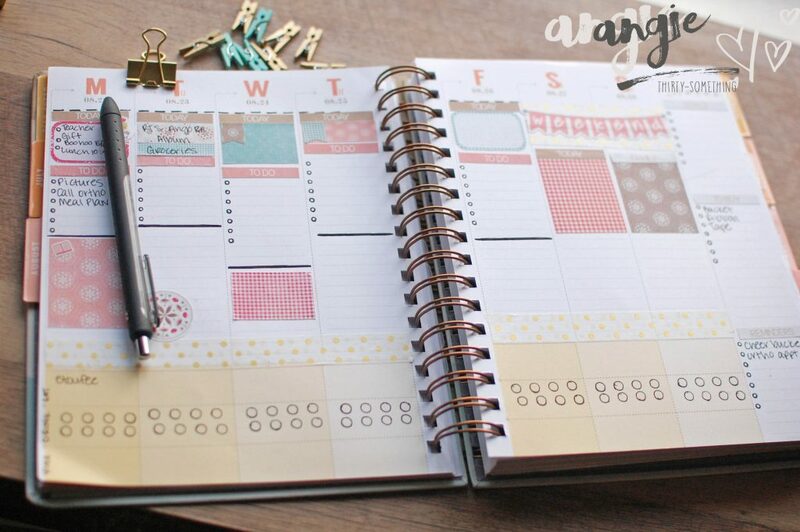 Love staying organized, but don’t think a planner is the best choice for you? Check out my post on how I use my bullet journal! 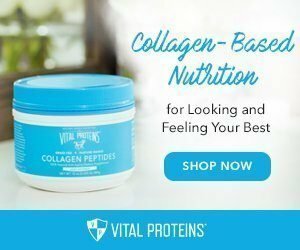 You had me at goals and gift list! I seem to always be adding to my “To Do” list in my planner, but I almost never record my goals (how do I then plan on accomplishing them???) and I come up with great gift ideas in the shower or something and then completely forget! I need this! Oh goodness! Yes, the goals are my FAVORITE part of the planner! I love that I can go back and check on my progress every few months. There’s actually a quarterly goals page as well, so you can break down BIG goals to be more manageable. Seriously. 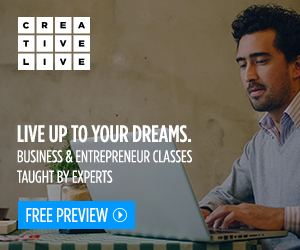 This is perfect for goal-getters! 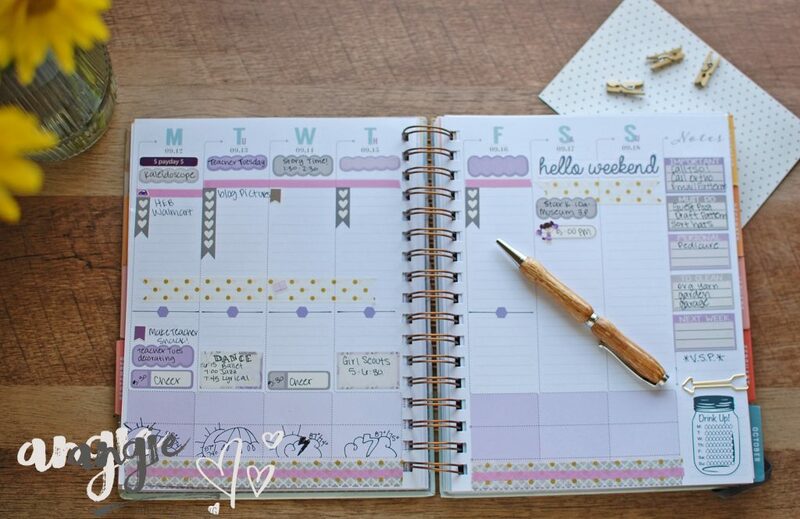 I think it’s a great planner besides that i find it very cute! I need one like this in my every day life as my to-do list is full at the moment and not so organised. Thanks for sharing your tips Angie! Hi Helene! You’re very welcome! I highly recommend the Inkwell Press planners! I’m glad you enjoyed the post! 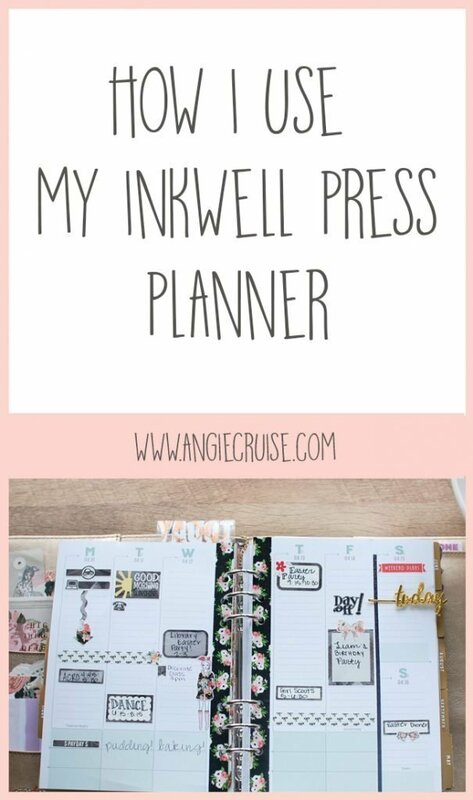 I just ordered my first inkwell press planner and can’t with to get it! Hey Heather! You’ll love it!! I’m about to order the classic inserts! Those mason jar bottles are from Small Town Grace on Etsy!